Hargus Creek Lake Hargus Creek Lake is in Pickaway County. The lake has 146 acres of fishing water with 5 miles of shoreline. Ohio Division of Wildlife District 1. 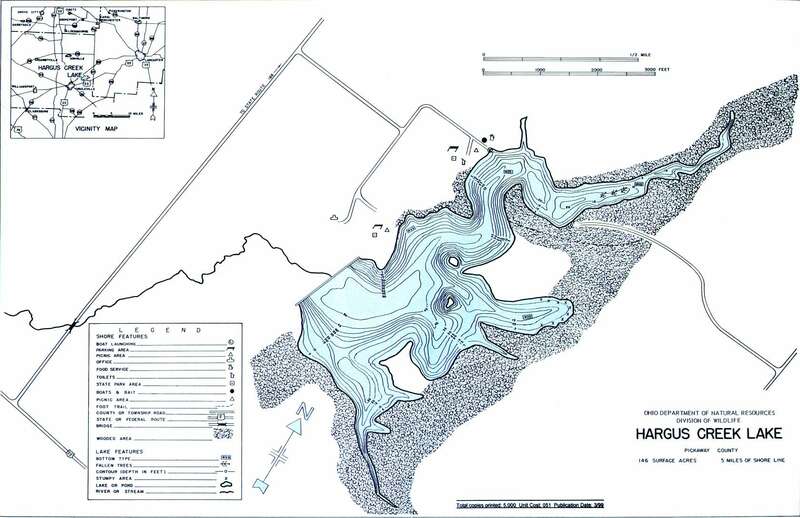 Location Hargus Creek lake is located in Pickaway County. Just northeast of Circleville and north of US Route 22. It is bordered by the A.W. Marion State Park. Distance from Major Cities Approximately 25 miles south of Columbus — Approximately 70 miles east of Dayton — Approximately 85 miles northeast of Cincinnati. Fishing Opportunities Largemouth Bass * Bluegill * Catfish * Crappie are found in Hargus Creek Lake. State Management The Division of Wildlife activities include monitoring fish populations – stocking – water quality analysis.